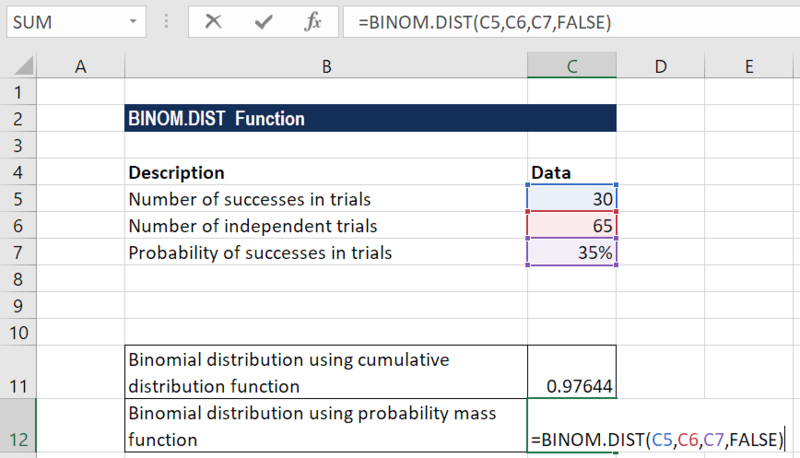 The BINOM.DIST function is categorized under Statistical functionsFunctionsList of the most important Excel functions for financial analysts. 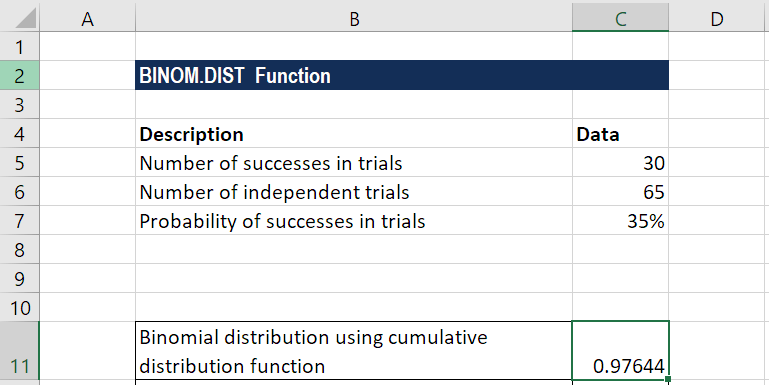 This cheat sheet covers 100s of functions that are critical to know as an Excel analyst and will calculate the binomial distribution probability for the number of successes from a specified number of trials. 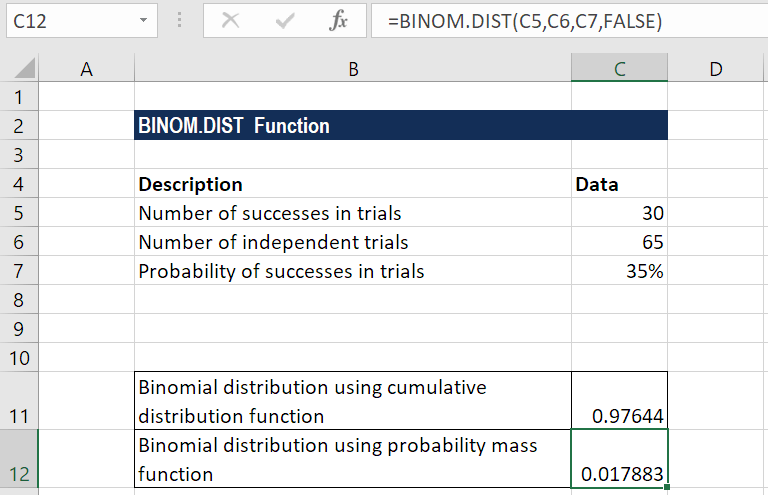 This binomial distribution Excel guide will show you have to use the function step by step. In financial analysisFinancial Analyst Job DescriptionSee a real Financial Analyst Job Description including all the skills, experience, and education required to be the successful candidate for the job. Perform financial forecasting, reporting, and operational metrics tracking, analyze financial data, create financial models, the BINOM.DIST function can be useful in finding out the probability of publishing a best-selling book from range of books to be published by a company. 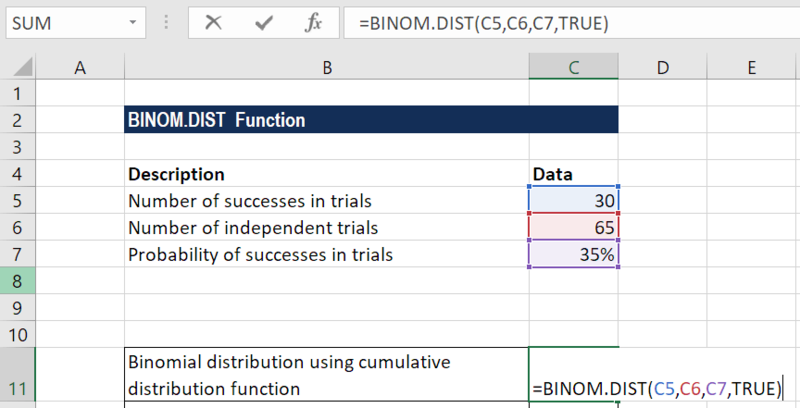 Introduced in Excel 2010, BINOM.DIST function is an updated version of the BINOMDIST function. Number_s (required argument) – It is the number of successes in trials. Trials (required argument) – It is the number of independent trials. It must be greater than or equal to 0. Probability_s (required argument) – It is the probability of success in each trial. TRUE – Uses the cumulative distribution function. FALSE – Uses the probability mass function. How to use the BINOM.DIST Function in Excel? The BINOM.DIST function will truncate all numerical values to Integer. The given probability is less than zero or greater than 1. The given number_s is less than zero or greater than the trials.